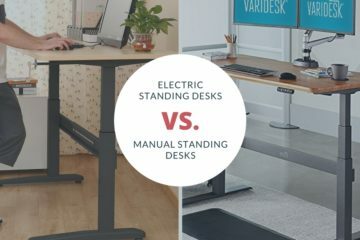 Home » Office Equipment » Standing Desks » Electric Standing Desks vs. Manual Standing Desks: Which Are Better? Before buying a height adjustable standing desk or a sit-to-stand desk converter, many people ask themselves the question: do I need an electric standing desk, or a manual one? Well, read this article to find out! As you may have already seen in our standing desk buying guide, they come in a variety of shapes, sizes, models, and of course, electric and manual. In that guide, we give detailed overviews of what each product is and when you may consider using it, but there was still left this nagging question that is: which is truly better? In this article, you will find full comparisons of the strengths and weaknesses of each style, and also our overall opinion of the best products in each category. We should point out that we will be looking at both standing desks and sit-to-stand desk converters. Desk converters are more likely to be manual, although there are some electric ones. The opposite can be said of height adjustable standing desks, most are electric, yet there are also manual models. We like to think of standing desks in two broad categories: full desks and desk converters. Full desks are a replacement for your current desk, whereas converters sit on top of your current desk using it as a base. Standing desk converters sit on top of your regular desk and for this reason, are smaller and more compact. This means that they have a smaller lifting capacity than a larger height adjustable desk. These manual versions of these desk converters use air-pistons or spring assisted lifting mechanisms to allow the user to move them from compact to fully extended positions. The will generally have handles on either side of the desk with a type of paddle or level that you can squeeze, move the desk, and release. The electric version will generally just have a single button to control the vertical motion of the unit. In our opinion the Vivo is one of the best products on the market. Spacious, good adjustable range, and a dual-tier design make it very ergonomic, and 33 lbs lifting capacity allows it to hold two monitors comfortably. 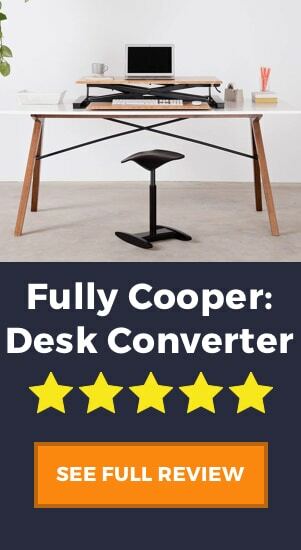 The Cooper is widely recognized as one of the best standing desk converters. It has an elegant design, fantastic stability, and great adjustable range. It is affordable given its sturdy build and the strong materials used. A height adjustable desk is a full unit that will replace your current desk. For this reason, it is usually fairly large and can bear a large amount of weight. These products are more commonly electric due to the larger size and heavier weights, although there are a number of manual models too. The manual models generally use a crank mechanism to raise and lower the desktop. This crank is placed on the front or side of the desk and requires the user to rotate it to adjust the desk to the desired height. By far the most common style of manually adjustable desk uses the crank lifting mechanism. There is one more style that we have only ever seen in the Varidesk product ProDesk 60, which is a height adjustable desk with the same lifting mechanism as a much smaller desk converter (i.e. two handles and a gas-cylinder lifting mechanism). The electric models are generally more complex than electric desk converters, in the sense that they will have height control, a LED display, and customizable preset height settings. Update August 2018 – The Everest has been replaced by the new iMovR Lander. The Omega Everest is a big standing desk, capable of supporting 350 lbs of weight. It is one of few products that have an adjustable keyboard tray, a feature we love. It is also one of the the tallest standing desks on the market. The Varidesk ProDesk 60 has an interesting design, more like a converter. It is easy to assemble and use and has good overall stability. Let’s take a closer look at these manual standing desks to see why you would buy one, what makes it better than an electric, and what issues you may encounter. Now, this has to be the most obvious of all the differences between the two styles, but many people do find the manual option beneficial BECAUSE it doesn’t use electricity. If you use a sit-to-stand desk in an area with limited power outlets, or you are just trying to cut down on your consumption, then a manual standing desk will be great for you. The major benefit that a manual standing desk has of an electric one is the cost. This is pretty self-evident that a product with no motor or moving parts will be a lot cheaper than a motorized one. To give a rough estimate, you can assume that a manual standing desk will be around half the price of a similar electric version. This is true of any product that has moving parts, that the fewer moving parts and electrical components, the less likely you are to have faults. We must say that the majority of products these days have great warranty periods on their desks and on the motor and moving parts, however, if you prefer the idea of a longer lasting product the maybe the manual standing desk is the one for you. A question that gets asked often before people buy an electric stand up desk is: how loud is the motor? If you work in an office and noise could be an issue for you or your co-workers, then you be completely safe with a manual standing desk. 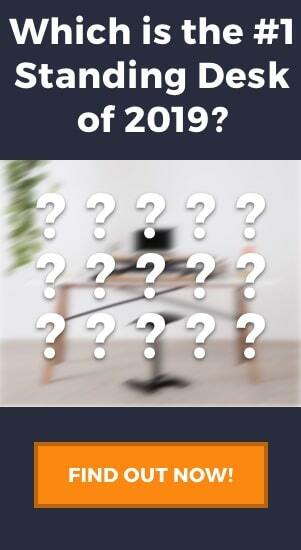 Apart from maybe a small grunt from you having to lift or lower the desk, there will be no noise from the desk itself! This doesn’t apply to desks that are adjusted with a crank, but to the desks with levers and handles that adjust the height. We see two main issues with the handle placement, and although these are both minor factors it is worth keeping in mind. Firstly, many desks have the levers on the outer edge of the desk. If you are shorter or have short arms, then reaching to each side of the desk will be more of a stretch, therefore you’ll have less power when lifting or lowering. The other handle position is on the desktop, which gives you a much more powerful stance to lift and lower the desk, as your hands are close together. However, the issue with this position is the fact that the levers are placed very close to the keyboard tray and may take up some valuable keyboard and mouse space. We addressed this issue a few times in our Varidesk reviews. As we mentioned, all the manual desks have assisted lifting mechanisms, whether it be a crank, spring, or gas cylinder. However, this doesn’t mean that it doesn’t require some force from the user. In fact, with certain products, people have complained that the lifting of the desk is not too difficult, but pushing it back down against the force of the spring or gas-cylinder can be difficult. This is especially true if you are shorter and cannot use your body weight to help bring the desk back down. In general, manual standing desks will not be able to hold as much weight as their electric counterparts. Manual height adjustable desks on average can carry anywhere between 130 lbs – 180 lbs, whereas most electric desks can carry from 250 lbs to 350 lbs. In terms of standing desk converters, these numbers are far lower, between 30 – 60 lbs, with electric again being more sturdy. A crank standing desk will have what as known as smooth or infinite height adjustability, which means that there are no set height levels and you can stop exactly where the desk fits you best. However, the majority of manual desks generally have height levels, anywhere from 7 to 15 different levels depending on the brand. This is not a deal breaker, but it just means that the heights will be around an inch apart which doesn’t give full control to the user. Electric standing desks are almost the exact opposite to desk converters in terms of their style. 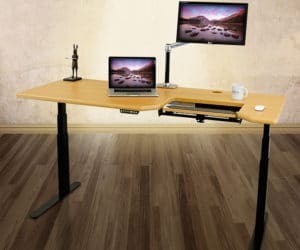 As we looked at before, there are two main types of electric standing desk: height adjustable standing desks, and standing desk converters. Height adjustable desks much more commonly appear in electric models, whereas converters are more commonly manual. In this area, electric standing desks are hands down the better option. If you like to have multiple monitors, extra books and papers, a laptop, and all the other bells an whistles on your desk, then you’ll need that added weight capacity. Almost all full electric desks will have a weight capacity of at least 250 lbs, and many of them even go as high as 350 lbs. People for whom electricity consumption and proximity to outlets is not an issue, then electric desks can provide a further benefit. Many electric desks these days offer the use of a power board to plug in phones, laptops, and USB chargers. The sit comfortably on the desk so all your charging items are within reach. Not only do electric standing desks have infinite adjustability (meaning there are no set height levels), many of the top range desks have preset heights available. If you share a desk with someone or you like to have the exact same setting for seated work and standing work, then you can preset up to 4 height levels. At the press of a button, you will be at the exact same height every single time. This factor is especially important if you are the type of person to have a full desk of items while you work. Imagine if you had 300lbs worth of monitors, laptops, keyboards and more, and you had to manually move that from low to high positions. Fortunately, with an electric standing desk, adjustments are as easy as just lifting your finger. 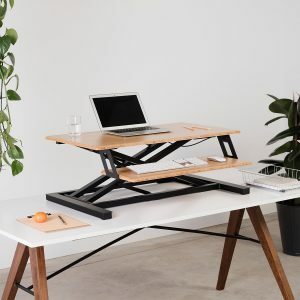 As we already said, on average an electric model will cost you twice as much as a manual one, however, there are still cheap standing desks that are electric. If a cheap price is your number one goal, then manual desks are the way to go, but we believe that the added cost is well worth it in terms of ergonomics and overall standing health. Working is closed environments requires a very quiet standing desk. If silence is the most important factor to you, then possibly a manual desk is a better option for you. Electric standing desks have a range of motor noise levels, with the average being around 50 to 60 dB. We suggest looking for the quietest options available, as the motor can be a distraction. 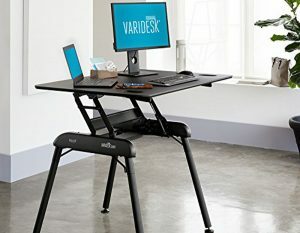 Manual standing desks are great for people who want a sit-to-stand option but don’t want to spend too much money on one product. If you don’t mind a bit of physical exertion to lift and lower your desk, then a manual stand up desk will be absolutely fine. We should also say that it depends on how active you are during the day. People who don’t move from seated to standing very often can get away with a manual standing desk as it is not going to bother you in the long run. If you are a mover and you like the ability to change up your position every hour, then buy an electric standing desk, you’ll thank yourslef after moving it 8 times in one day! Lastly, we don’t recommend a manual standing desk to anyone with existing injuries or issues. The force of lifting and lowering a desk may not be too great, but it puts some stress on your lower back, or on your arm and wrist in the case of a crank. This movement repeated daily will take its toll and could cause further pain for those with pre-existing issues. 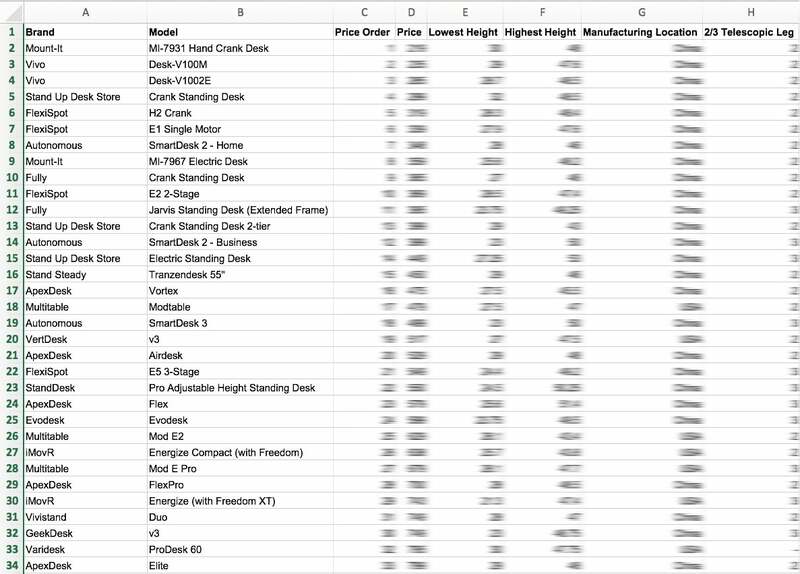 So to break it down: if you are going to buy a full-size height adjustable desk, then get an electric one. 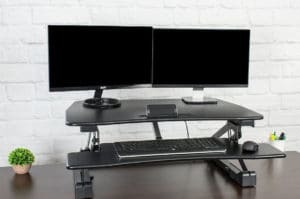 If you only want a standing desk converter, then the choice is yours and there are more options in the manual models, so we would head towards these first.